at least 12 people died and 50 were injured due to a severe cyclone that hit the Tamil Nadu coast at Cuddalore on 29 November, 2000. 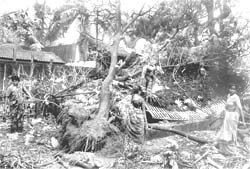 The cyclone was a result of a deep depression in the Bay of Bengal. It generated winds at the speed of 90-110 kilometre per hour. Most of the deaths were caused due to electrocution or collapse of walls. The cyclone has lead to large-scale destruction in Cuddalore and neighboring Pondicherry. Uprooted trees and broken lamp posts have caused road blockage in both the places. At least 20,000 trees were uprooted in Neyveli town. Lack of power supply and disruption of telecommunication and railway services disrupted normal life.